Right before the start of Shavuot, on May 14, Israel’s chief rabbis, the British ambassador to Israel, airline employees and others took part in an event to mark the completion of the writing of the El Al Torah Scroll for the Unity of Israel. El Al CEO Elyezer Shkedy, who initiated the writing of the Torah Scroll, said the project was motivated by a desire to help strengthen ties between the Jewish population in Israel and around the world. Shkedy told a group of journalists about this Torah during the American Jewish Press Association’s press tour in January and I was fortunate enough to “write” a letter in this Torah (through a scribe, of course) during an El Al-sponsored dinner at a Tel Aviv restaurant. I feel like I was in very good company, as thousands of people have inscribed a letter in the Torah Scroll for the past three years — including Prime Minister Benjamin Netanyahu, Israel’s President Shimon Peres and Noble Prize winner Eli Weisel. In Washington, D.C., this past December, the sefer Torah was signed by several U.S. senators and members of Congress, including Joe Lieberman, Debbie Wasserman Schultz and Eric Cantor. At the United Nations, Israel’s Ambassador Ron Prosor added a letter to the Torah. The Torah scroll, which contains 304,805 letters in 249 columns, will be kept in the synagogue on the El Al campus at Ben Gurion International Airport, according to a press release, and will accompany Israeli leaders on flights of national and historic significance. 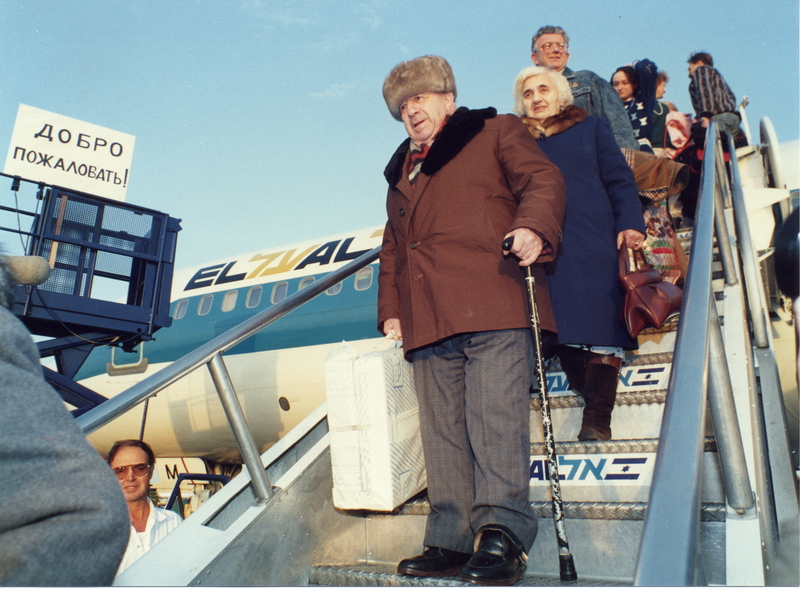 As part of Operation Exodus, EL AL assisted in airlifting hundreds of thousands of Soviets to Israel in January 1990. This week’s issue of Jewish News celebrates the 65th birthday of Jewish News and Israel. We recently received a release about another entity celebrating 65th anniversary: EL AL Airlines. To mark its anniversary, EL AL is remembering a few historic highlights that helped shape the birth and rise of Israel’s national airline. May 1948: Israel was established as an independent state. September 1948: The first Israeli registered civil aircraft carries Israel’s first designated president, Chaim Weizmann, home from Geneva where he was temporarily stationed before Israel’s declaration as a state. 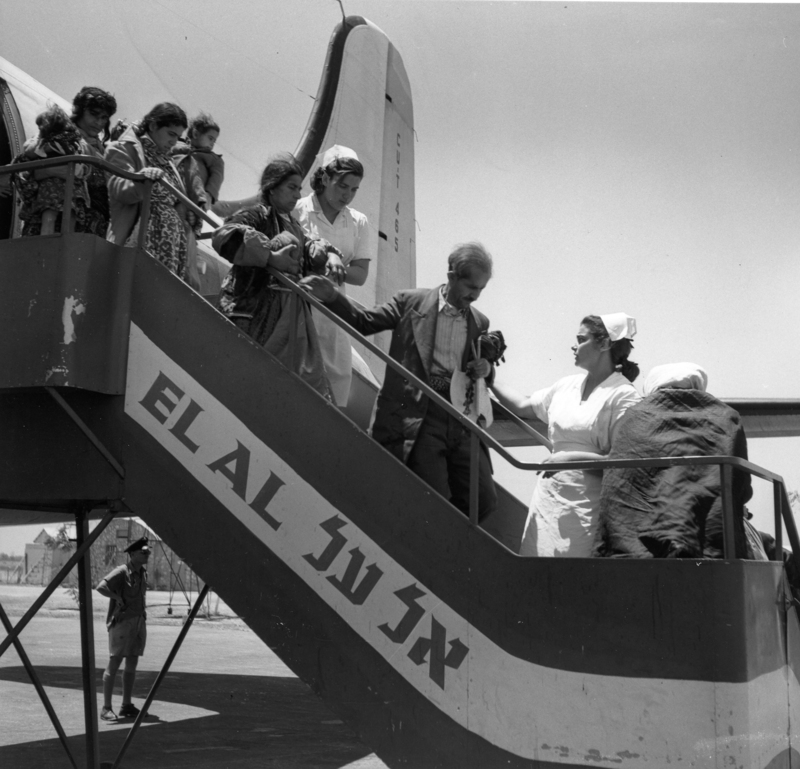 January 1949: EL AL assists in Operation Magic Carpet, airlifting 49,000 Yemenite’s to Israel. May 1950: EL AL assists in Operation Ezra & Nehemiah (also known as Operation Ali Baba), airlifting over 120,000 Iraqi’s to Israel. April 1951: Inaugurates regular scheduled service between Israel and New York. April 1973: First airline to schedule nonstop service from Tel Aviv to JFK (previously called Idlewild Airport). June 1984: First scheduled service from Tel Aviv to Los Angeles. January 1990: EL AL assists in Operation Exodus, airlifting hundreds of thousands of Soviets to Israel. May 1991: EL AL assists in Operation Solomon, the airlift of more than 15,000 Ethiopians from Addis Ababa to Israel. One 747 carried 1,087 passengers, a world record that still stands today. June 1994: EL AL schedules first nonstop service between Newark International Airport and Tel Aviv. 2003: EL AL became a private airline. EL AL notes that travelers interested in learning more about the historical and interesting rise of the national airline can read “EL AL: Israel’s Flying Star,” an illustrated book written by Marvin Goldman, who has the largest museum-like collection of EL AL memorabilia. L AL also highlights some of Israel’s most prominent historical figures and sights in a series of cards, written in both English and Hebrew. Anyone interested in obtaining a complimentary set of cards can visit EL AL USA Facebook (EL AL Israel Airline USA). As an added bonus, now through Independence Day, April 16, EL AL USA Facebook (EL AL Israel Airlines USA) fans can share what Israel means to them for a chance to win one roundtrip ticket to Israel. In addition, EL AL USA Matmid frequent flyer members and EL AL USA Facebook fans can also save up to 35 percent on phone service in Israel with TalknSave! This exclusive offer is also valid through Israel Independence Day, April 16. For more information about EL AL or to book a flight, visit www.elal.com or call EL AL at (800) 223-6700. Learn more about special promotions as well as activities, special events, and useful travel tips to Israel, plus more by joining the airline on Facebook (EL AL Israel Airlines USA) and Twitter (@ELALUSA). In May 1950, EL AL assisted in Operation Ezra & Nehemiah (also known as Operation Ali Baba), airlifting more than 120,000 Iraqi’s to Israel. ROLE “EDGARDO”: BOY age 6-9 to play 6 years old. This is a unique and very challenging part for a truly special boy. The story deals with the complexity of an extremely intelligent and gifted child’s situation – his desire to return to his family and the faith of his ancestors, pitted against his ability to learn the Catechism and engage with the Pope on a level far beyond his years. He should appear to be a Jewish Italian child. We are not looking for any kind of Italian accent. STORY LINE: “The Kidnapping of Edgardo Mortara”— Steven Spielberg is making a film about the true story of EDGARDO MORTARA – a 6-year-old Jewish boy from Bologna who was reported to have been secretly baptized by a maid, and was deemed by the Catholic church therefore to be Christian. Pope Pius IX (to be played by Mark Rylance) decreed that the boy could not remain with his Jewish family. He was seized by the Papal State and taken to the Vatican where his indoctrination into Catholicism began. This was a cause célèbre of mid-nineteenth century European politics and the domestic and international outrage against the pontifical state’s actions may have contributed to its downfall amid the unification of Italy. This is an incredible story of real historical relevance. Please note several CD’s are covering this project, per overall CD Ellen Lewis: We (Debbie DeLisi/DeLisi Creative) are covering people that live in all regions in the US/Canada, EXCEPT if LA, CA (CD Tannis Vallely) & NYC based (Rori Bergman). If you’re based in LA or NYC, submit to Tannis or Rori. If you are based in any other area — please submit to us at delisicreative@gmail.com. To submit: Email delisicreative@gmail.com. Subject line: EDGARDO SUBMISSION / Name of boy, city/state. Body of email: Parents/Guardians contact info (names/phone), boys name/age/d.o.b, city/state of residence, along w/current non retouched photos. If you’d like to include a brief introduction, bio or resume, please do! Please note any related, special, or fun facts so we get to know him! Tuesday, June 21 is International Yoga Day and in recognition of this, the Valley of the Sun Jewish Community Center is hosting four free yoga classes tomorrow. 6 p.m. Power Yoga, which provides challenging poses to increase strength and stamina. The classes are free and open to the community. Participants should wear comfortable clothes and bring water. The Valley of the Sun JCC is an inclusive community center open to all ages, faiths, backgrounds and abilities. It is located at 12701 N. Scottsdale Road, just south of Sweetwater. In a statement issued from Nevada last week, Hindu statesman Rajan Zed commended the VOSJCC for offering these free classes, as well as offering regular yoga training. Yoga, referred to as “a living fossil,” was a mental and physical discipline for everybody to share and benefit from, which can be traced back to around 2,000 BCE to Indus Valley civilization, noted Zed, president of Universal Society of Hinduism, in the statement. He further said that yoga, although introduced and nourished by Hinduism, was a world heritage and liberation powerhouse to be utilized by all. According to Patanjali who codified it in Yoga Sutra, yoga was a methodical effort to attain perfection, through the control of the different elements of human nature, physical and psychical. The statement also included information from the U.S. National Institutes of Health, which said that yoga may help one to feel more relaxed, be more flexible, improve posture, breathe deeply and get rid of stress. According to a recently released “2016 Yoga in America Study,” about 37 million Americans (which included many celebrities) now practice yoga; and yoga is strongly correlated with having a positive self-image. Yoga was the repository of something basic in the human soul and psyche, Zed added. Two Valley residents – Rabbi Dr. Shmuly Yanklowitz and Marcia Fine – recently presented ELI talks, highly produced 12-minute presentations that “explore central themes of Jewish literacy, religious engagement and identity, presented in light of their presenter’s own work, personal experiences or Jewish or secular texts,” according to elitalks.org. They presented their talks in Chicago in November 2015 and their videos recently became available online. In “How Far Will You Go to Give? Judaism and Organ Donation,” Yanklowitz, president and dean of Valley Beit Midrash, talks about how his experience volunteering in a small village in Ghana almost 15 years ago led to his recent decision to donate one of his kidneys to a complete stranger. Israel’s Athena Fund has announced a new program: iPad for Every Special Education Teacher in Israel. Through the new program, about 10,000 special education teachers in Israel will receive iPad computers with specialized software and applications for students with special needs and various disabilities. Each teacher also will receive 120 hours of training. The program will enable students with special needs to communicate with their teachers, while training them to integrate into society, according to a press release from the Athena Fund. The new program was launched in two cities in central Israel with a mixed population of Jews and Arabs – Ramla (72,000 residents) and Lod (74,000 residents) – and in the Circassian town of Kfar Kama (3,142 residents), located in the north. This is Athena’s fourth program. The first – Laptop Computer for Every Teacher in Israel – was launched in 2006, the second – Laptop for Every Kindergarten Teacher in Israel – was launched in 2012, and the third – Tablet for Every Teacher of Science and Technology in Israel – was launched in 2014. The decision to launch the iPad for Every Special Education Teacher in Israel program was made after the positive results of an iPad usage study were reported by special education teachers and students in two schools in the city of Rishon Letzion, near Tel Aviv. The iPad enabled special education teachers and students to engage in meaningful learning. Access to the iPad was immediate, intuitive and led to enjoyment and motivation. The use of iPads resulted in challenging and rewarding learning and strengthened students’ motivation. In addition, the iPad improved interpersonal communication, and students with high-level thinking and comprehension skills were discovered. The iPad opened a window to the inner world of students with special needs, and helped improve student performance and quality of life. In addition, the use of the iPad in the two schools in Rishon LeTzion substantially changed students’ lives. Interpersonal communication at home was also enhanced. Children who previously found it difficult to communicate with family and teachers expressed their feelings and desires by writing on the iPad. Significant improvement occurred also in motor skills and hand-eye coordination of children with special needs. Students fully completed tasks that they could not complete before. The iPad and the special applications also allow students with physical disabilities to cope better with their difficulties. The Athena Fund is a nonprofit organization established in 2006 in order to promote the empowerment of teachers in Israel by providing them with tools for self-fulfillment and professional advancement. The fund was founded by several prominent business leaders under the direction of Ben-Ari (CEO of UBA Ventures and former executive vice president of Ness Technologies). The fund’s flagship initiative is the innovative Laptop Computer for Every Teacher in Israel program. This program has so far distributed laptops to over 11,000 teachers in 939 schools and kindergartens in 430 towns, cities and small communities in regional councils, together with professional training courses. The program’s goal is to provide a laptop computer and 120 hours of professional training to every teacher in Israel by 2018. The teens in the Jewish National Fund’s inaugural Schwartz-Hammer Alexander Muss High School in Israel Impact Fellowship Program are in the final stages of their six-week journey at the Alexander Muss High School in Israel (AMHSI), a college-preparatory summer abroad program that uses Israel as the classroom. Here, the students reflect on the past week. This very well might be the only Sunday in which we haven’t stayed on campus! The morning started off in the town of Sde Boker in the Negev. At Revivim, we learned about Ben Gurion’s dream of building up the Negev. We saw meteorological instruments and remnants of the first kibbutzim. There was a well-animated video expressing all of Ben Gurion’s aspirations and followed the region chronologically through its growth. It was amazing to see his passions and visions come to life. Our next stop was his house. The rooms were fully intact and depicted the same scenes as the famous pictures. What a concept- such a visionary living so humbly. At Ein Ovdat, we hiked through the beautiful landscape of the Negev. The dirt walls stretched from the clouds to the pools in the valleys. It was not an easy expedition but definitely worth it. After a much-needed shower, I headed into town for dinner with a friend. We had a competition to see who could fit the most falafel into their pita. I think I won with a total of 10, but I’m pretty sure the record is around 17. My day was as jam-packed as my pita! Today we continued learning about the founding of the state of Israel, specifically David Ben-Gurion. We learned how twice in his life he abandoned comfort and security to devote himself fully to the development of Eretz Yisrael. The story of him resigning as prime minister to move to a kibbutz in the Negev was surprising and funny. It was difficult for me to fully understand why someone would leave the most important job in Israel to develop a desert. In America, it would never happen that a president or anyone with a lot of power would resign to do a meager job in a seemingly insignificant place. But the true beauty of Israel, more than the physical beauty is the devotion of the people. David Ben-Gurion realized that to develop a Jewish state, the Jewish people had to develop themselves to be better through hardship. The Negev presents the perfect opportunity for people to build themselves. I now fully understand why Israel is the leader in technological advancements they are today, they have to be. To survive in such a difficult place people must innovate to survive. David Ben-Gurion knew this in the 1950s and was completely right to build a Jewish state he must build the Jewish people. It saddens me to say that our last tiyul (class) has come to a close, but it’s with happiness that I say it has been my favorite tiyul at HSI. The past two days were spent in the Golan Heights, the northern most point of Israel. We had a jam-packed two days, but it was so worth it. Yesterday we left campus bright and early and had a bit of a drive to the Golan. We had class atop a Syrian bunker, heard a fascinating speaker at thekibbutz that overlooks Lebanon and went rafting down the Jordan River. Yet, today was my favorite part. This morning we woke up, ate a hearty breakfast and prepared for a treacherous hike. The hike and sweat was completely worth it when we came across a magnificent waterfall. We all hopped in to the cool water where we had a fun swim while we cooled off. After the fun, we had to trudge back up the mountain. I have done hikes here that I never would have done myself. Knowing what I am capable of now is completely different than what I thought before this experience. We stopped for lunch at a falafel place and then headed to the Syrian/Israeli border. We had another extremely interesting class (aren’t they all?) about the 1973 war while we looked out into The Valley of Tears where it happened. What an extremely powerful moment. From there, the next destination was a kibbutz where we watched a fascinating yet really helpful documentary about the war. Sitting there and seeing live action happening at the valley that we were just sitting at was absolutely mind-blowing. On our way back to campus, we stopped at an overlook of the Hula Valley where we split into classes and had a serious talk about our past tiyulim. Everyone said what their favorite tiyul was, what materialistic item they love and what intangible item they are bringing home. It feels like I have been in Israel for months, yet I can recall the first day of HSI exactly. This is my last blog post and I can’t express everything I am feeling. I can’t even begin to sum up these six weeks…there is no “sum up.” Everything I have learned and seen will be with me forever. I have memories that will last me a lifetime. I truly feel like I lived in a different country, was immersed in a different culture and grew as a person. I hope to share everything I have felt and learned with everyone at home and maybe spark something in someone else. Being in Israel makes everything clearer, every moment brighter and every memory happier. 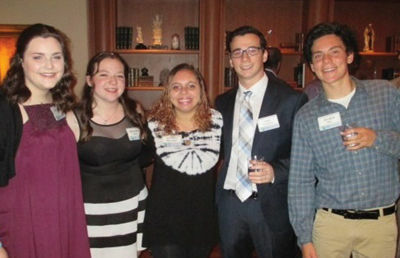 The five teens selected for Jewish National Fund’s inaugural Schwartz-Hammer Alexander Muss High School in Israel Impact Fellowship Program are now in Israel. 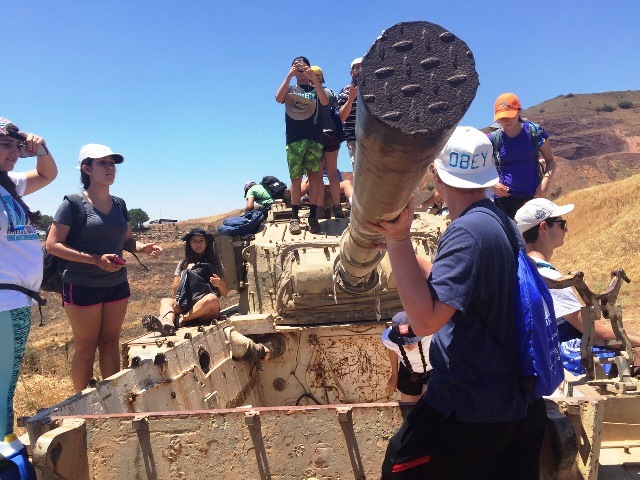 Their six-week journey began on June 16; they are attending the Alexander Muss High School in Israel (AMHSI), a college-preparatory summer abroad program that uses Israel as the classroom. Here, all five students reflect on the past week. As every other day, we learned a lot! However, today was different. Today I learned about the HSI (High School in Israel) community and what it really means. At first, when we all learned that there were over 180 kids, many felt very overwhelmed. But let me just tell you: It’s amazing how fast word travels around here! Both Gabe and Reuben have been challenged with injuries and sad life events and it’s been amazing to watch the entire campus come together. Whether listening to side conversations or watching friends carry pints of ice cream to their doors, it’s so easy to see that we all really are one big family! Instead of spending my free time deciding what to do, I now focus on figuring out ways to maximize it. I spent the afternoon making new friends in the Rapaport dorm and accompanying them to the local restaurant, Ofer’s. Later, I went to town with a couple of friends. Together, we stopped in every market in town – about eight – buying a few items from each place. Our purchases included: cookie dough ice cream, dinosaur-shaped chicken nuggets, strawberry-banana juice and Cap’n Crunch. It’s really starting to feel like home. I can’t even begin to think about leaving! Today we woke up early to go on an exciting tiyul (trip) in the northern region of Israel! We began by learning about the Crusaders, at the beautiful Belvoir castle. After that, we swam in the Kinneret. It was nice to be back in the lovely waters of the Sea of Galilee. Although it was lovely, I wish I brought shoes! The heat of the ground paired with the sharpness of the rocks was quite painful. After the brief swim, we headed over to Tzfat, one of my favorite cities in Israel. The beautiful stone paired with the bright colored doors enchanted by the spirituality of the city makes for a great time. Walking around the familiar city, buying jewelry, and showing newcomers my favorite places was nostalgic and fascinating. Additionally, I ran in to someone I know back at home. Crazy! This week has been rough one. Sadly, I broke my clavicle while playing football a few days back; however, I’ve still managed to have a fantastic time! Today was a day to remember. It began with class. Once we finished, we were given the option to stay back and study or go to SACH. SACH stands for Save a Child’s Heart – a nonprofit organization that brings in children from around the world for lifesaving heart operations. I love working and playing with kids, so I decided to take up that option. Many of the children that we played with were from Ethiopia. 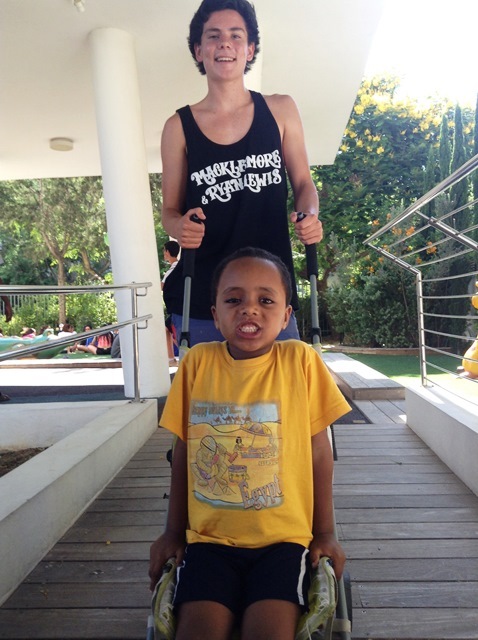 I spent most of the time playing with my friend Rihad, one of the cutest and most fun kids I’ve ever met. I rolled him around on his little stroller and then played ball with him and some of my other friends. We got back around six o’clock. I went to dinner and then studied for our upcoming exam. Today we continued studying the early Zionist movements in our core class. But I would like to focus more on the mystical city of Tzfat that we had the privilege of touring a couple days ago. Tzfat is considered to be a mystical city because the Kabbalah was developed there. Beyond the beauty of the city and surrounding nature, I felt there was a deeper sense of community (kehillah) than in most places we’ve visited. I think that sense of kehillah may derive from the deep studies of Kabbalah. It was interesting to see the other side of questioning our universe from the Jewish perspective. I appreciated that opposed to Hellenists, Jews focused more on what to do, what is right and what is wrong and how to be truly good people (most Hellenists never would have thought about how to be a good person if it didn’t involve slaves or some other morally iffy pillar of their culture). But I felt a bit disappointed that Jews never got into the truly exciting questions that many Hellenists struggled with. It has always excited me to think about philosophical questions and struggle with competing answers. That feeling of disappointment immediately disappeared after learning more about the Kabbalah. It was difficult to really understand the Kabbalah from a single half-hour discussion – most Kabbalists study it for half their lives! But while speaking to a local artist, Abraham, I gained a more meaningful understanding. During my conversation with Abraham I was transfixed upon the largest motif within his art – selflessness. Nearly every work had some representation of giving of yourself for the benefit of others as inspired by the Torah. I had previously learned a little bit about the levels of giving in Judaism, but in discovering the Kabbalah, I gained a far deeper understanding while being provided with even more fascinating questions. It began at Kfar Giladi, where we had class on the roof of the museum of HaShomer (the Guardians). Before we even spoke a word, our teacher had us look out into the distance – both north and south – and to think of adjectives we would use to describe what we saw. We all collectively wrote down terms such as: picturesque, vast, green, serene, breathtaking, etc. Only then did we begin class and travel back in time to when there was nothing. After we learned about the brave pioneers who traveled to Am Yisrael from Russia in the years 1904-1914, we went inside the museum and watched the extremely informative videos. 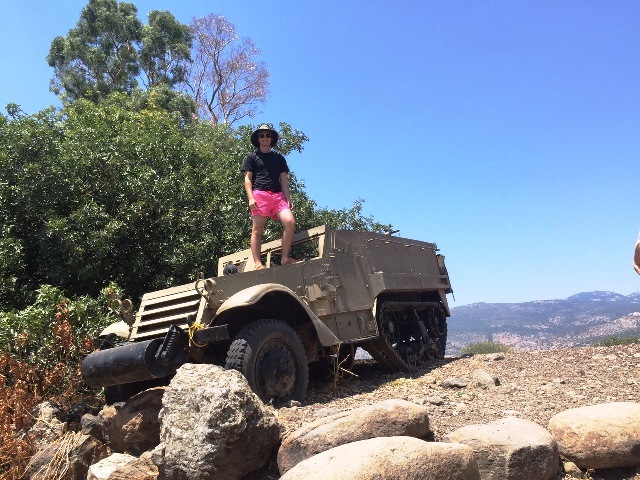 We learned about “HaShomer,” the first Jewish defense force and how they had to learn from each other how to defend their people. From Kfar Giladi, we went and had delicious lunch at a spring. We ate, went swimming, and sat around and listened to Yosef and Phillip play guitar. 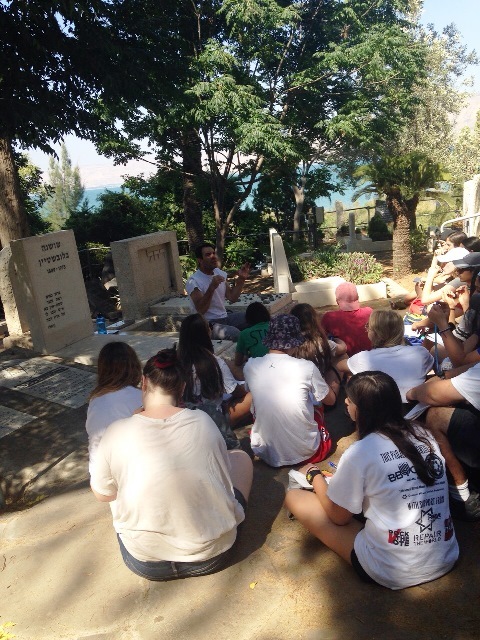 From there, we had another 40-minute ride to Tiberias, where we had the most powerful class of the day at the Kinneret Cemetery. We sat around the grave of Rachel the Poetess as we learned about her exemplary life. She was a pioneer who came to the land and then ended up going back to Russia where she helped out in an orphanage. There, she was infected by tuberculosis yet she didn’t know. She came back to Am Yisrael, made a life in the Kinneret, and wrote rather romantic poetry about the beauty and love she has for the Kinneret. She was quarantined in an apartment in Tel Aviv where she ended up dying but even there she would write poetry based upon the memories she carried with her. After class, Phillip pulled out his guitar, and we sat around the brave pioneer’s grave and sang her beautiful words back to her. The class gathered in a circle where we all shared who we thought were heroes, anyone we know personally or throughout history. Someone may be a hero in someone else’s eyes by the doing the smallest favor. The biggest heroes seem to be the ones who don’t believe they are. We had DOTS: Dinner on the Streets, where I got some delicious shawarma. Later, we went to a chocolate factory and had some amazing ice cream. There is nothing compared to the ice cream in Israel – it’s beyond amazing and refreshing! It feels as if I have been here for months yet time is slowly nearing the end. This experience has already been life-changing and has given me memories that I will have for my entire life. Being able to learn our history exactly where it happened is something that everyone should be lucky enough to experience. The five teens selected for Jewish National Fund’s inaugural Schwartz-Hammer Alexander Muss High School in Israel Impact Fellowship Program are now in Israel. They will share their experience with Jewish News readers through the newspaper’s JN Blog. 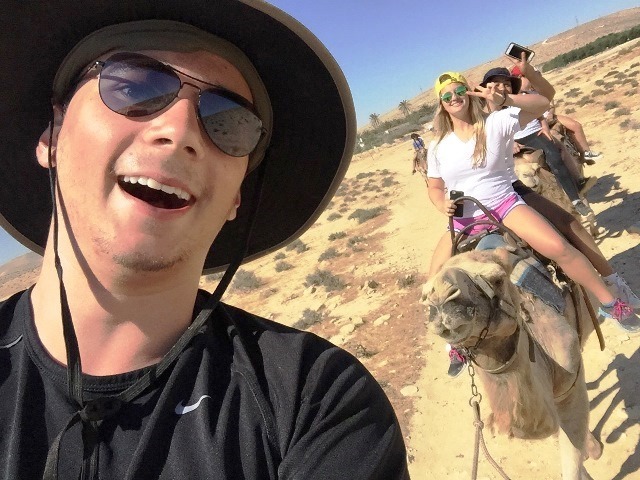 Their six-week journey began on June 16; they are attending the Alexander Muss High School in Israel (AMHSI), a college-preparatory summer abroad program that uses Israel as the classroom. Click here to learn more about the fellowship. Here are the initial posts by two of the high school students: Gabe Friedland and Madeline Stull. Beep beep beep! It was 4:45 in the morning on Tuesday and I was off to the airport. After meeting with my friends at the Phoenix airport and sleeping the whole way to New York, we realized we were about to meet the kids we would be spending our summer with. We were collectively tired, excited, hungry, and maybe a bit nervous. It took time to find where we were actually supposed to be but once we did, we were engulfed into a room full of card games, laughter, introductions, reunions between old friends, and finally, food. The five-hour layover flew by and quickly we began to board the plane. After a lovely nap on the plane to Tel Aviv and waiting in the lines at passport control, we were whisked onto buses and taken to the dining hall on campus. The long trip was finally concluded with a meal of pasta and hummus. In the dorm, we set up our rooms, showered, and either passed out from exhaustion or stayed awake the entire night. Onto a lovely orientation session in which we were shown the campus and explained the rules of the program, but far more interesting than that was our first class. After 11 years and various summer programs and classes, I have only seen a teacher with as much passion for teaching their material twice before. A simple introductory game turned into a funny, vivid explanation for the importance of history to Jews. I have been in Israel for about two days and I can already tell that I will learn more than I ever have in six weeks, and I will have a great time doing it. Thursday morning we had orientation. At orientation the rules and regulations of the program were explained to us in detail. More than just the rules, we were told all the freedom given to us on this trip. I was so excited to learn how frequently we can go into town, where we can go, and all that we can do. As compared to other trips, this amount of freedom is absolutely amazing and I can’t wait to use it! After the formal orientation, we had our first class. My teacher is Mordechai and he is wonderful. Already on our first day we learned so much. We learned about the Torah, the Tanach, and about Abraham. Our homework was to read the Enuma Elish, the Mesopotamian creation story and read the first three chapters of the Torah, the Jewish creation story. Then we had to compare and contrast the two and the values they both put across. By reading the Enuma Elish, we can see the cultural values that Abraham was raised in, then compare it to the religion’s values that he was the father of. The difference was astonishing. Twenty couples from the Valley are currently in Israel as part of Honeymoon Israel, a trip to Israel for couples that is being piloted in the Greater Phoenix Jewish Community by Valley Beit Midrash. Larry Hirsch, one of the participants, is sharing his experiences from the trip as a guest blogger. Here is his final post. Our final night in Jerusalem was spent having Kabbalat Shabbat at a park overlooking the hills of Jerusalem with Rabbi Shmuly, planned guest Avraham Infeld and surprise guest Rabbi Jeremy Schnieder of Temple Kol Ami in Scottsdale. This was followed by Shabbat dinner at the Dan Panorama Jerusalem and an hour with Avraham Infeld – who was, easily, the single best speaker I have ever heard on Judaism and Israel. Now tracking backward, the last few days have included the following: touring the Machaneh Yehuda market in Jerusalem and then cooking lunch with a local chef; meeting Ketubah artist David Moss and creating our own works of art; Western Wall tunnels; Masada; floating and cocktails at the Dead Sea; a lecture by professor Reuven Hazan regarding the Israeli political system and the differences from American-style democracy; touring the Jewish Quarter of the Old City; visiting Yad Vashem; learning about the Druse people on Mount Carmel outside Haifa and eating Druse cuisine in a home overlooking the Haifa port and surroundings; visiting Majd al Krum, an Arab village in Israel and meeting with high school kids and families to get their views on being an Arab living within the Jewish State; exploring Tzfat and having a chance to meet with Kabbalah artist David Friedman; kayaking down the Jordan River; driving to the top of Mount Bental and looking down on the Syrian conflict; and dining in a mango orchard in the hills overlooking the Sea of Galilee. And by the way, there is a plenty that has been left off this list. The trip has been an experience of a lifetime. It has been awesome and tiring and special and thought-provoking. It has been, as the slogan for Honeymoon Israel suggests, all about the journey.